After breakfast, we boarded the bus for a 30-minute ride to Fortuna Dusseldorf to watch them train. Their training grounds are next to Merkur Spiel-Arena where they play. Their impressive stadium holds 54,600 spectators and has a closable roof. The players participated in a 75-minute session which included dynamic movement, some fitness and a keep away game. During the session, some of the ODP players began playing pick up small-sided games on two small turf fields. We arrived back at the Wedau Complex in time to have lunch and get ready for all three teams’ evening games at the Wedau Complex. Our 03’s played first with a 5:30 p.m. start during the daylight and finishing the game at dusk under the lights with the sun setting behind our goal. It was a comfortable evening for soccer. 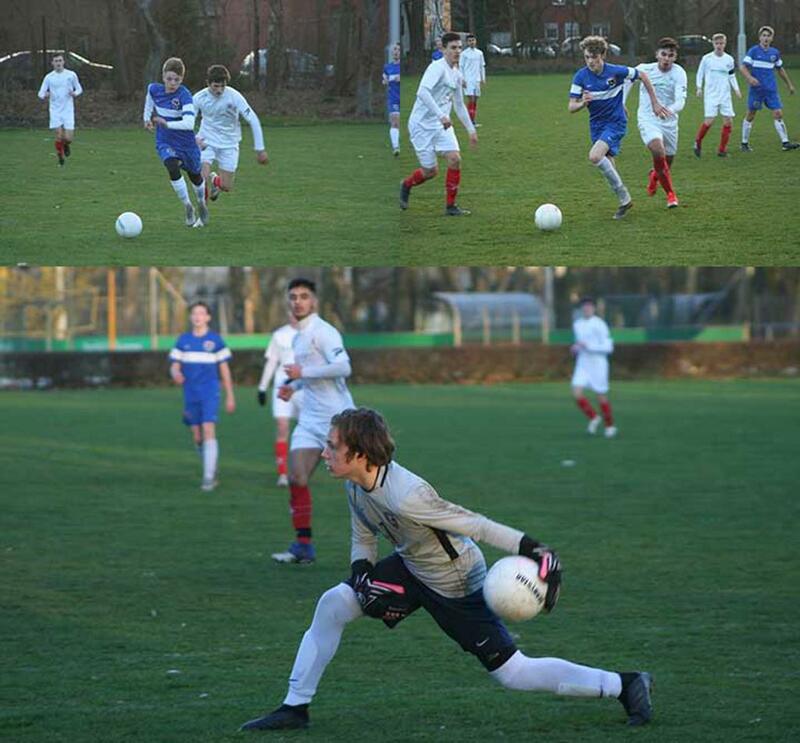 The 03’s created some chances throughout the game while also dealing with the strong attack of RW Oberhausen. 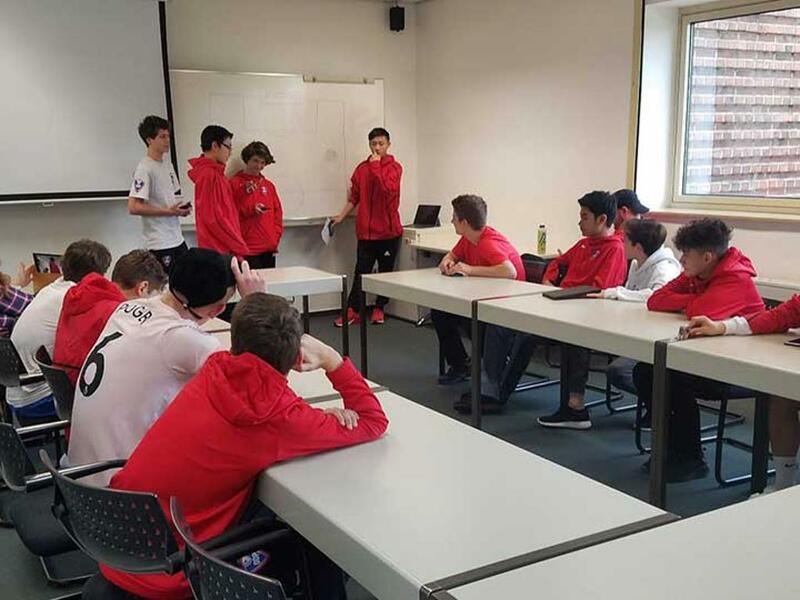 With this being the third game in five days, signs of tired legs started to show, however, the boys played hard and kept positive, continuing to embrace the experience and learning opportunities the game provided. Our 04’s and 02’s both kicked off at 7:00 p.m. against two very strong opponents; 04’s vs. ETB Schwarz-Weiss Essen’s U16 and 02’s vs. RW Oberhausen’s U17. For the 02’s, playing against a team a year older proved to be a lot as they were under pressure for the entire 70 minutes. ETB Schwarz-Weiss Essen’s U16 team was unique to other teams we played as they had a female U16 German National Team player on their roster. As one of the teams’ most skillful players, she had made her national team debut with Germany’s U15 vs the United States Youth National Team. Despite the constant pressure and tired legs, the boys were in good spirits following the game getting a group photo with the opponent. A few fields over, the 02’s were playing simultaneously. They were excited and felt good and it showed as they gave their best performance of the week. In addition to some fantastic individual performances, the team played well together and despite playing three excellent and competitive teams, our 02’s were able to dig deep to find the energy to perform once more. Another highlight of the day was when the 04’s gave presentations on a topic they researched related to German history. Topics included the creation of Gummy Bears, the Berlin Wall, adidas and German food. 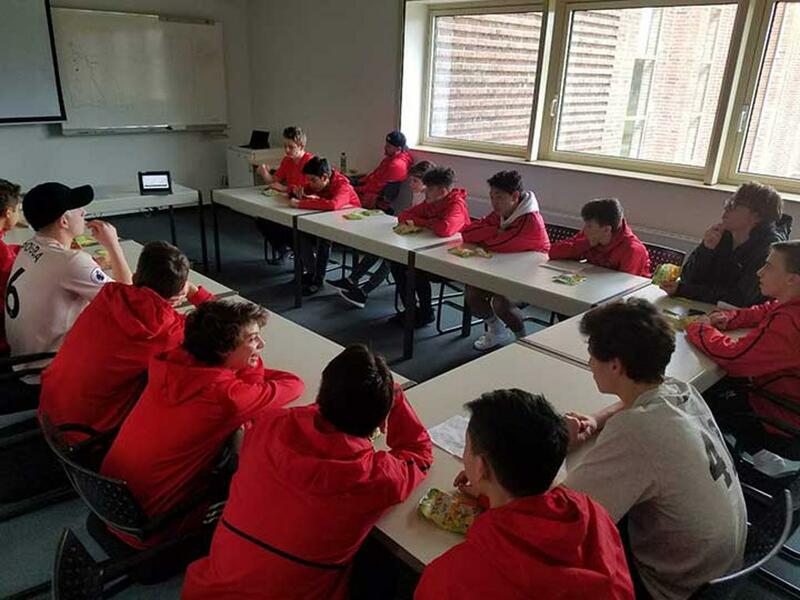 We all learned something new about Germany and this assignment gave our players a chance to work and bond in smaller groups during their free time. We had another very full day. It’s hard to believe that this will be our last evening at Wedau. We will miss the soccer immersion, the food, the accommodations and hanging out with each other at this exclusive soccer school. Adieu to Wedau and Duisberg and thank you for your hospitality, tomorrow we will be Frankfurt bound.